Unique water soluble sulphur containing compounds are produced as garlic ages, which have a powerful effect on the cardiovacular and immune systems. Other constituents with antioxidant properties and prebiotic activity are also found in garlic. Kyolic is naturally odourless. Kyolic 600mg may support cardiovascular health. Also suggested to support the immune system. Why use Quest Kyolic Garlic 600mg? Take one or two tablets daily with the main meal. Swallow with water. Individuals taking warfarin should not take more than 1200mg/day. Individuals taking platelet inhibitors should avoid. 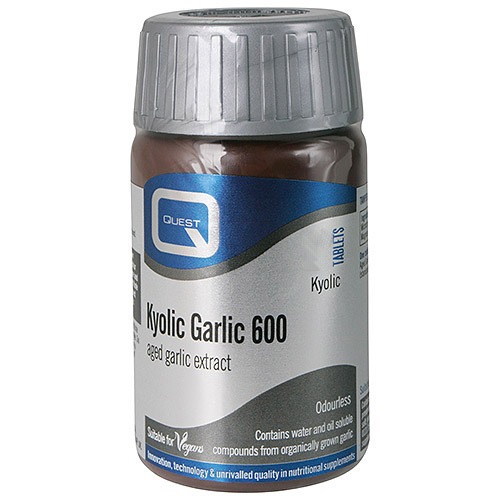 Below are reviews of Kyolic Garlic - Aged Garlic Extract - 30 x 600mg Tablets by bodykind customers. If you have tried this product we'd love to hear what you think so please leave a review. This is a superb product that does really help the immune system. The service from the supplier is first class. Always have these at home. Great for taking during tummy bug, upset stomach or food poisoning. Also recommended by nutritionist, so must be good. Work great in conjunction with acidophilus. Thank you bodykind, excellent product and such prompt service online. I'll buy our next one from you for sure! Have stayed healthy this winter and recommend Kyolic garlic, as well as the real thing, of course, when not in close proximity to others, lol. Good price and quick delivery from bodykind as well. Excellent company great prices great products fast delivery. What more could you want, thanks a lot. Good product, great offer too! Really pleased, boosts our immune system in autumn and winter. Quest Kyolic 600mg is may support cardiovascular health and the immune system. Unique water soluble sulphur containing compounds are produced as garlic ages. Kyolic is naturally odourless.